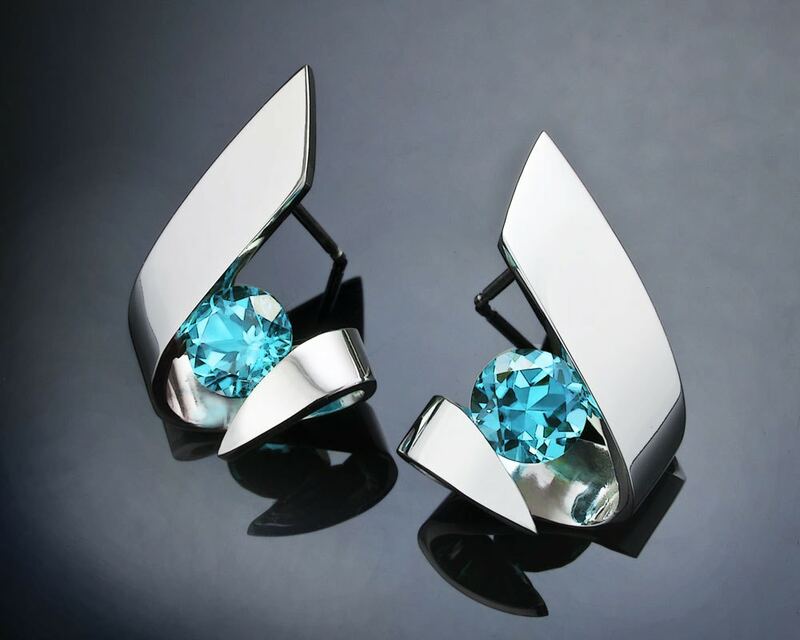 Turquoise Topaz Earrings - Argentium Silver - 2440 A contemporary, yet timeless design by award winning designer, David Worcester. MEASUREMENTS AND MATERIALS: Cast in Argentium 960 premium quality 100% recycled silver, these earrings, specially processed for tension setting, measure 19mm x 14mm, or 3/4 x 5/8 inches, each holding a 6mm turquoise topaz. This item shipped on time and also looks stunning. If I ever need to order jewelry again I will start looking here to see what they have! These earrings are beautiful. They are just as pictured . The color is vibrant and the silver is bright and shiny. Thank you. WOW!! Gorgeous! The earrings are amazing and Helen and David are great to work with. They answered all of my questions, confirmed my order, shipped immediately. I'm very happy with everything. In fact, I purchased 2 more of their pieces. Just awesome.